Party Over for Nasdaq QQQ, AAPL, AMZN? Tech stocks have been on fire before hitting an ‘air pocket’ last week. Is the current dip the end of the tech party or a buying opportunity? Seven days after the May 31 bearish reversal candle, the Nasdaq suffered a monster reversal candle. Volume (for QQQ) soared to a 2017 record. The June 9 ‘red stick’ erased 10 days of gains. On that day, more than one third of the 100 QQQ ETF components suffered a buying climax (where a stock rallies to a new 52-week high, but ends down for the week). 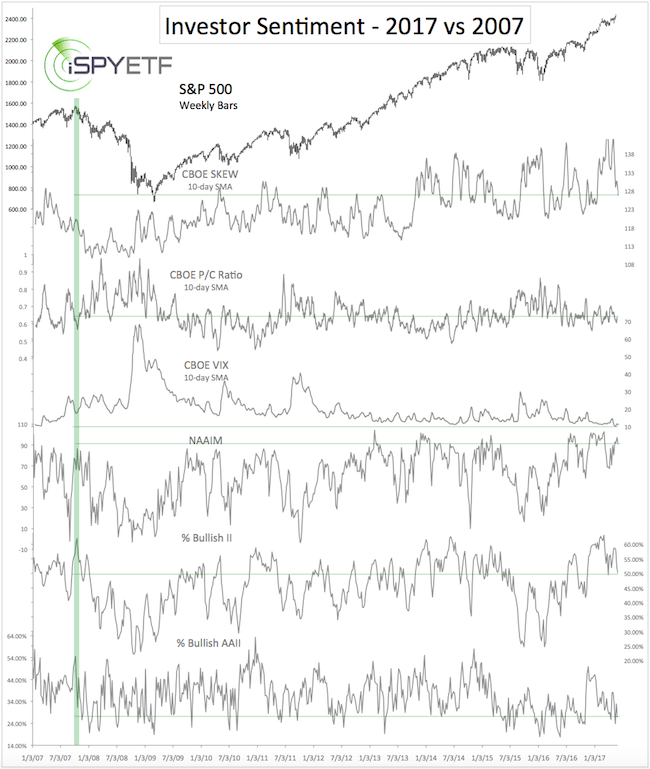 Buying climaxes are generally a sign of distribution and indicate that stocks are moving from strong to weak hands. Similar buying climaxes in 2010, 2014, and 2015 led to noteworthy pullbacks. The problem with extreme ‘air pocket’ days (like June 9) is that they almost instantly create an oversold condition, and the propensity for a bounce. 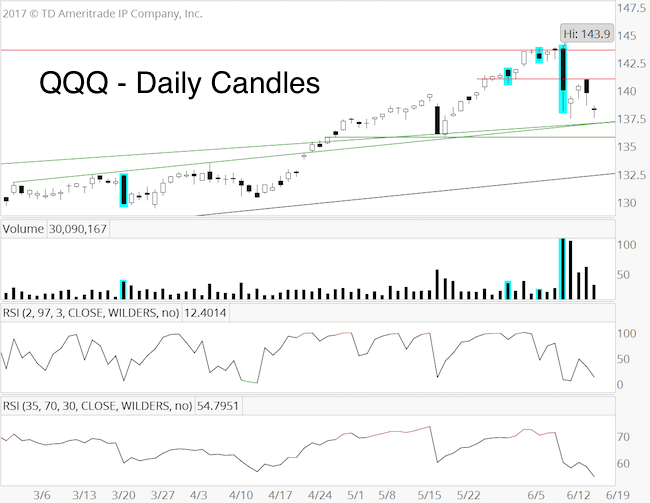 Next support for QQQ is at 137.20 – 135.70. Resistance is around 141. Support may cause another bounce, but risk of further losses remains elevated as long as QQQ is below 141. Due to its humungous market cap, AAPL is Wall Streets’ VIP and MVP stock. More often than not, if AAPL sneezes, the S&P 500, Nasdaq and at times DJIA will catch a cold. 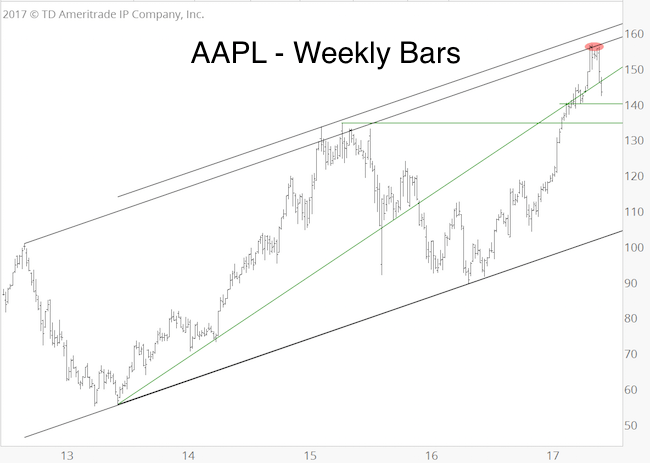 Based on the long-term black trend channel(s), we determined that up side for AAPL (and indexes like the S&P 500 and Nasdaq) was limited after hitting 155 in May. Support worth watching is around 140 and 135. Since May 29, AMZN gained as much as 2%, but subsequently dropped as much as 8.8%, before finding support around 925 (green line). 925 and support near the black trend channel deserve to be watched. It would take a move above 991 to unlock the potential for new highs. 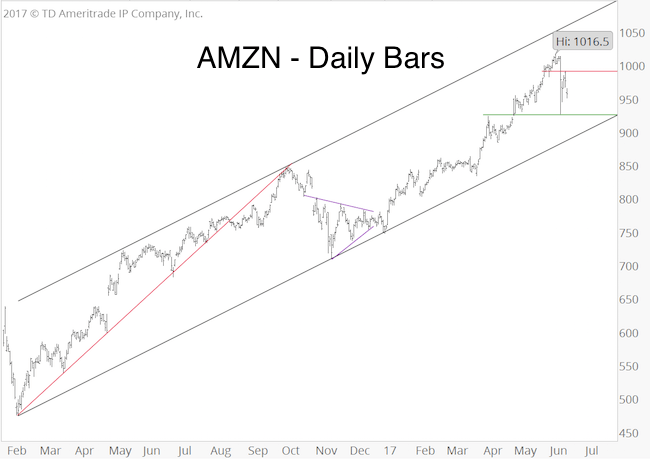 Based on our research, we don’t expect to see a major market top at this time, but QQQ, AAPL and AMZN are likely to enter a period of consolidation and quite possible some ‘shake out’ moves designed to shake out weak hands. The Profit Radar Report’s goal is to simplify investing decisions, avoid big losses and spot high probability, low-risk trades. 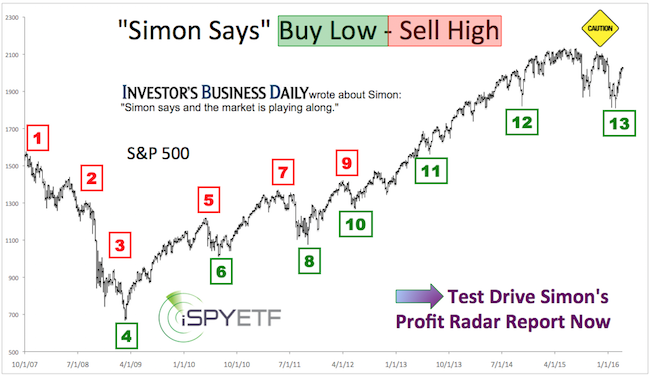 The Profit Radar Report hasn’t suffered a losing trade since June 2015. Will the S&P 500 in particular, and stocks in general, continue to slog higher? We first unveiled our favorite liquidity indicator in 2014. This indicator correctly foreshadowed the 1987, 2000 and 2007 market top and – aside from a timely caution signal in 2015 – persistently pointed towards continued bull market gains. For readers of our free website, we’ve dubbed this indicator ‘secret sauce.’ Why, and how this indicator is used is explained here. In short, major market tops have been preceded by bearish divergences (S&P 500 rallies to new all-time highs, secret sauce does not). Throughout 2016 and 2017 however, there’ve only been bullish divergences (secret sauce rallies to new all-time highs, but the S&P 500 lags behind). The last four times this happened was on April 30, and April 9, 2017, September 22, and April 16, 2016 (see green arrows). 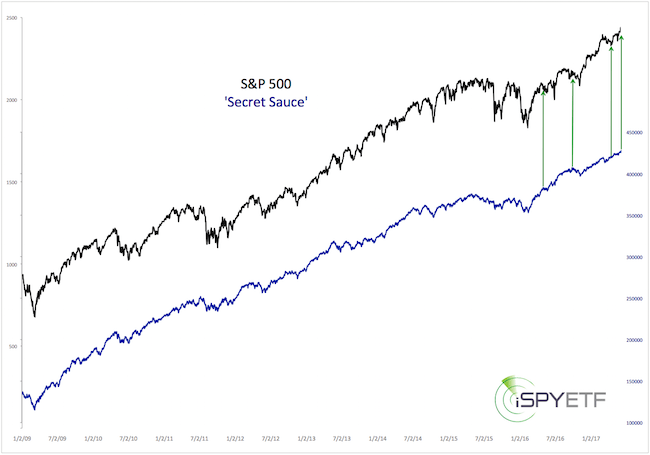 Secret sauce just confirmed the latest S&P 500 high, which means a major market top is still many months away (this doesn’t mean we can’t see a correction though). The most exotic ‘tool in the technical analysis box’ has also been the most accurate: Elliott Wave Theory. Therefore we will focus on Elliott Wave Theory for this update. 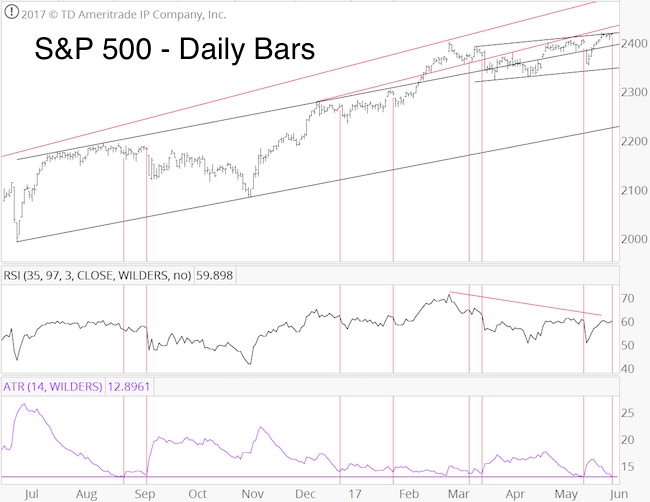 The charts below were initially published in the August 28, 2016, Profit Radar Report, and have been our roadmap ever since as the S&P moves toward 2,500. 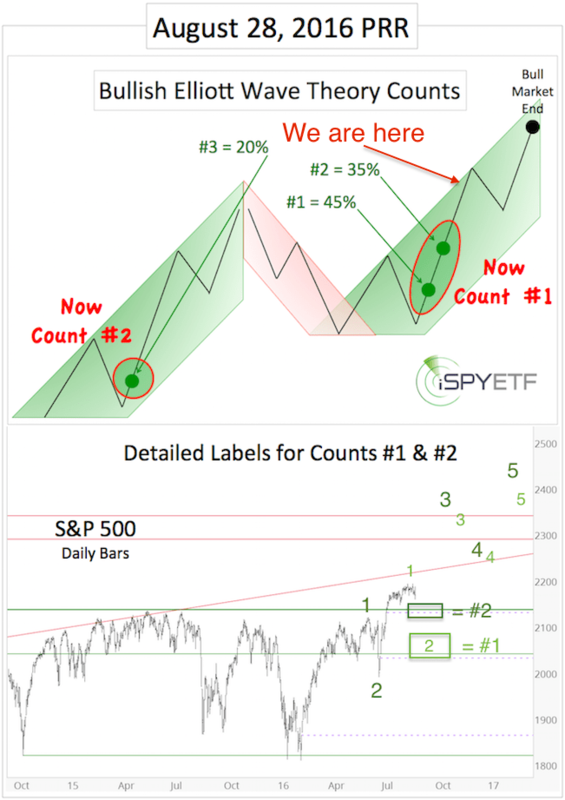 We have made some minor adjustments recently, which place the S&P near the beginning of a more pronounced, choppy correction (see ‘we are here’ on top graph). This correction would be labeled as wave 4 (likely intermediate degree). Despite rising prices, there has been a measure of internal weakness (see chart below). 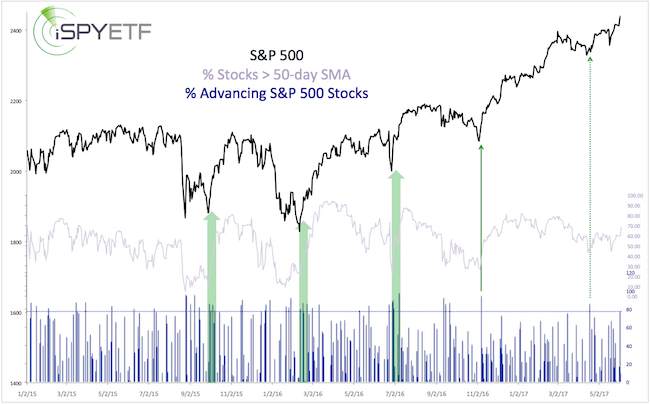 There have been no strong up days (90% days, where 90% or more of volume flows into advancing stocks). The percentage of stocks above their 50-day SMA is also lagging. This is compatible with a rally that’s nearing a (temporary) point of exhaustion. The chart below provides a long-term comparison between investor sentiment near the 2007 high and today. In short, investors are not as euphoric about stocks today as they were in late 2007. Based on investor sentiment, stocks are not at a major market top. In fact, stocks may still benefit from the pessimistic extremes seen in January/February 2016 (when the S&P traded below 1,900). Cycles project weakness later on in 2017 and seasonality is hitting a soft spot until September/October. Once the S&P 500 reaches our up side target we will be looking for a more pronounced correction, but not the end of this bull market. Continuous updates and actual buy sell recommendations (we haven’t had a losing trade since June 2015) are provided via the Profit Radar Report. 15 points in 12 weeks. That about sums up the S&P 500 ‘progress’ since March 1. Predicting a ‘go nowhere’ market is no fun, but it helps set expectations and limits frustration. Even within trading ranges, there are brief bursts where the market telegraphs its next move. 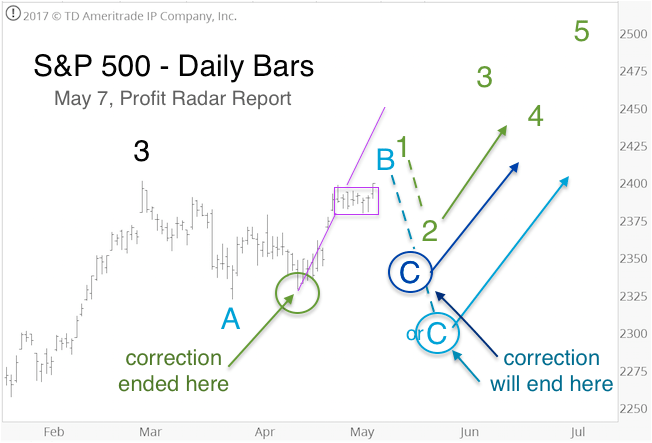 For example: The May 7 Profit Radar Report featured this chart with 3 projections (based on Elliott Wave Theory). Each option (green, dark blue, and light blue) projected a pullback around S&P 2,410 in mid-May followed by a renewed rally. The pullback happened on May 16, a day after the S&P hit 2,406. Although this pullback failed to hit our buy trigger (which was set a bit lower), buyers stepped in as anticipated. The S&P has moved as high as 2,419 and is currently held back by trend channel resistance (see chart below). The rally from the May 18 low at 2,353 seems to support the green Elliott Wave Theory-based projection. If that’s the case, the S&P will continue to move higher. Although Elliott Wave Theory has been very accurate in recent years (it projected the February 2016 low and the ‘Trump rally’), there are reasons (i.e. lake of breadth, bearish divergences, ATR – see vertical red lines in chart above) to take this bullish Elliott Wave projection with a grain of salt. Therefore it’s best to play the next moves step-by-step. A move above black trend channel resistance is required to unlock the next up side target (red trend line resistance around 2,430). A move below 2,400 and 2,380 on the other hand, would seriously rattle the immediate bullish potential. The longer-term outlook shared in the August 28 Profit Radar Report remains valid. Continuous updates are available via the Profit Radar Report.